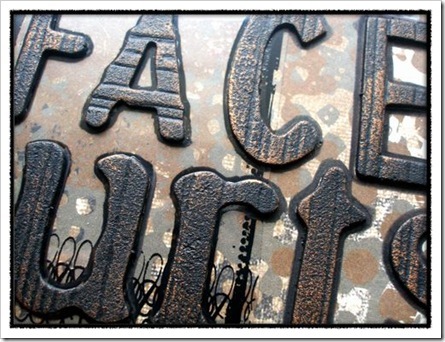 The Tim Holtz grungeboard would have to be one of Caz's favourite scrapping products at the moment. Apart from the fact that it is bendy and comes in a great range of textures, she loves that you get such a big variety of shapes in each pack. 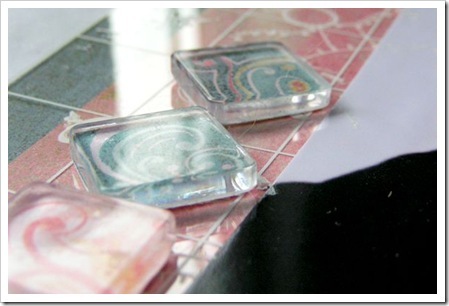 Here Caz has used some swirls, numbers and a hinge from the Elements shapes in Harlequin. She ran an ink pad over the top of each shape lightly to bring out the embossing and then flicked pale blue paint over it to tie in with the browns and blues of the paper and the colours in the photos. 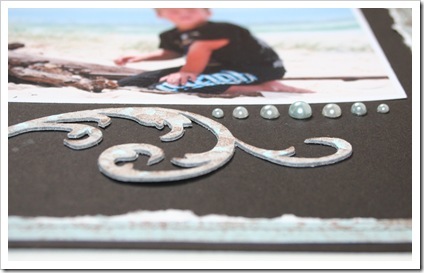 The Tim Holtz texture hammer is really cool. It comes with four interchangable tips and a seperate mini mat especially for using the hammer. Mel used the hammer in this layout on the her title (sick) creating a ripple effect on the letters. 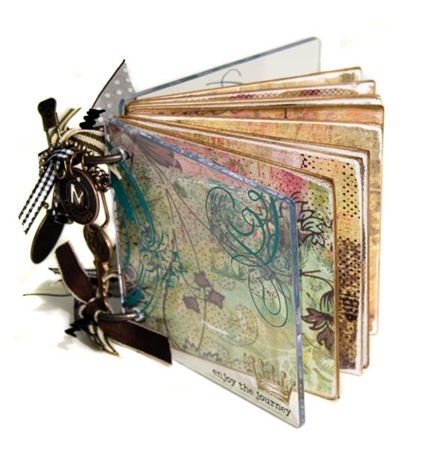 Suz was thrilled to discover the Tim Holtz Fragmentz that have just been released. 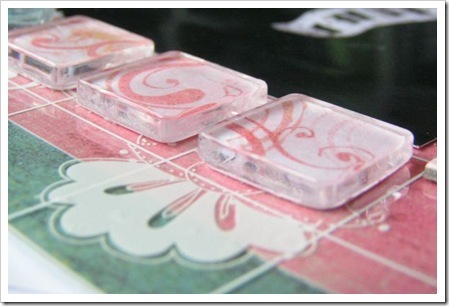 Just simple clear squares and rectangles of clear acrylic, these little 'fragmentz' are perfect for custom-embellishing any page. Suz backed these in co-ordinating patterned paper, but you could just as easily apply rubon words or designs to the top of them - or onto the patterned paper underneath. Now here's a threat. 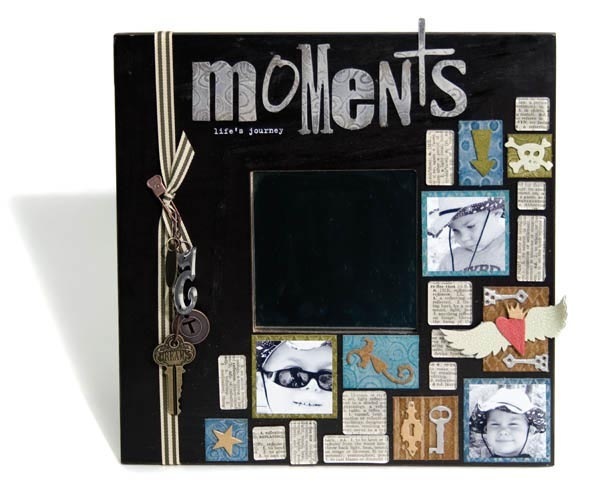 We're thrilled to be able to share with you some of Tim Holtz's projects in this post. 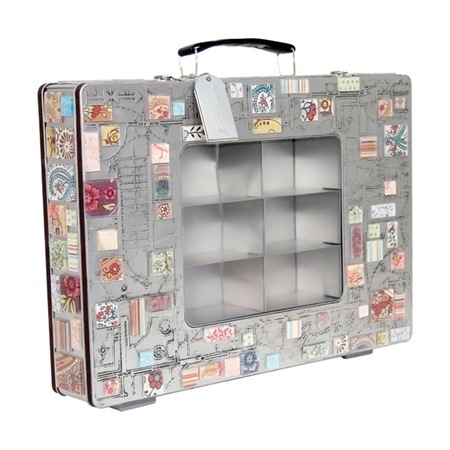 This is one of his stamp cases (we stock these too!) embellished with patterned paper covered fragments. How insanely gorgeous is it? Another fantastic project by Tim. In a pack of Fragments, as well as smaller squares and rectangles you also get one around 3.5" square - perfect to use as a mini album cover. (You can also use your Crop-A-Dile to punch through these Fragments, though it does takes some effort). Here Tim has not only backed some of the Fragments in patterned paper, but he has also used them to create his title. Love the light touch they bring, and the use of the Hambly transparency. Very scraplift-able we're thinking! Finally another using the largest Fragment as white space in the centre of an otherwise busy layout. Here Tim has gathered together lots of elements using not only his Fragments but also Grungeboard. He has inked the squares in the different textures offered by the Grungeboard as well as using shapes like the keys, flourishes and skull from the Elements pack to create this stunning and thought-provoking layout. The title is also in the Swirls Grungeboard Alphabet. A huge thanks to Tim for allowing us to share some of his ideas here. 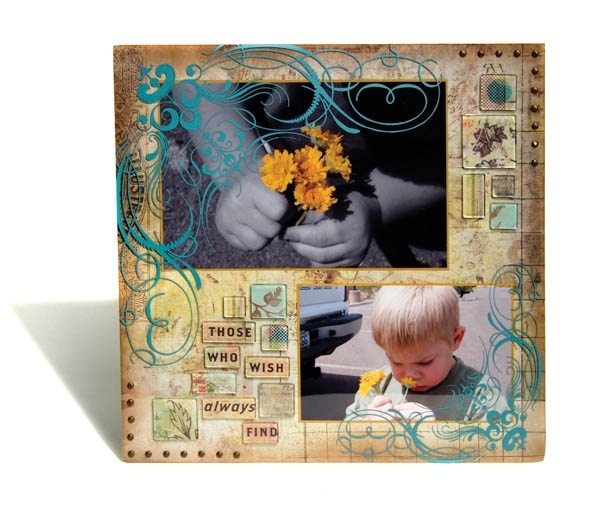 Another gorgeous layout from Sarah Schwerin! 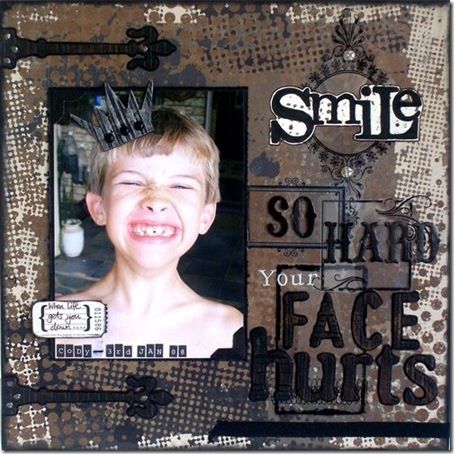 Sarah has used a mix of Tim Holtz products to achieve this look - Grungeboard alphabets, crown and hinges, painting them black, and then used metallic rub-ons to create a metal look finish. The texture hammer has also been used to bang up the brads on the hinges. 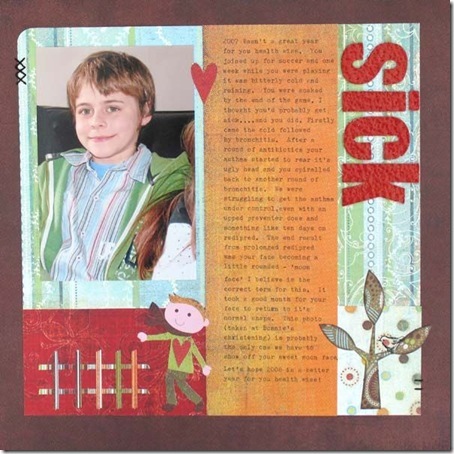 A beautiful boyish layout full of charm, thank you Sarah. Sarah Schwerin has been busy playing with the Tim Holtz Grungeboard - which she has used to create the prettiest heart on this layout. 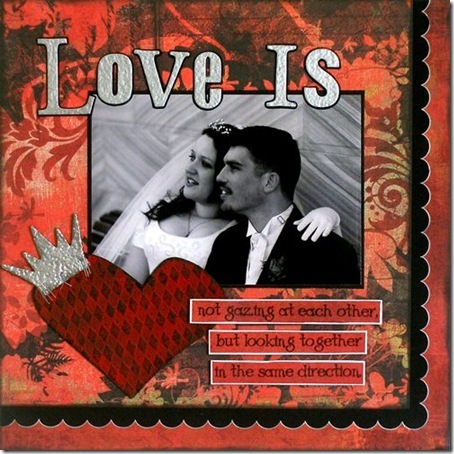 Sarah has also used the texture hammer on the Heidi Swapp chipboard letters, and the grungeboard crown. Such an awesome effect! 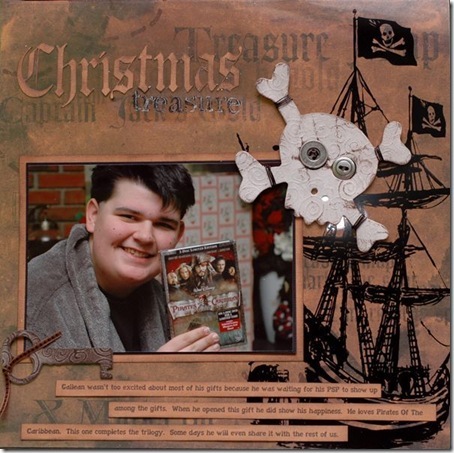 A huge thank you to Elsa Duff from Edmonton, Alberta for sharing this very cool Christmas Treasure layout with us. Elsa writes "I pretty well lifted the whole skull with wire and button eyes straight off of Tim's website. Love how grungeboard feels and how it takes to ink. I rubbed my ink pad over the key die cut and then using cut-n-dry rubbed it in. Looks like an old key! This is my autistic son Cailean. He loves Pirates Of The Carribean!" We loved your Pirates of The Carribean layout too Elsa! !